The value of two diamonds of the same weight can vary greatly depending on the color, clarity and especially the cut. Learn about what makes the A. Fishman & Son Diamond Cut unique! Below is an example of two diamonds, exactly the same weight, color and clarity. Which diamond would you and should you buy? The cut of a diamond — its roundness, its depth and width, the uniformity of the facets — all determine a diamond's brilliance. Many gemologists consider cut the most important diamond characteristic because even if a diamond has perfect Color and Clarity, a diamond with a poor cut will have dulled brilliance. 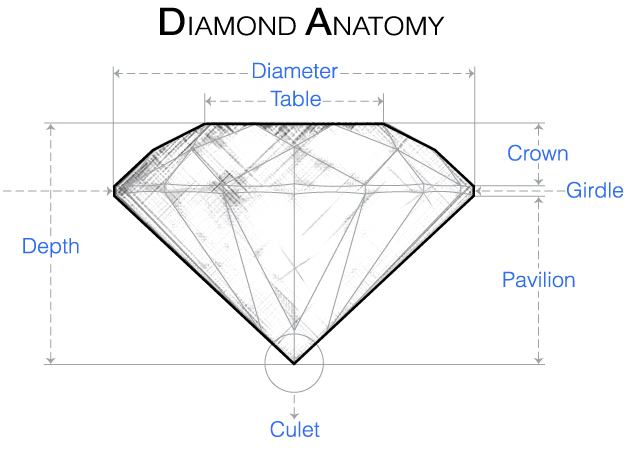 The diamond's proportions, specifically the depth compared to the diameter, and the diameter of the table compared to the diameter of the diamond, determine how well light will reflect and refract within the diamond. Culet: The facet at the tip of a gemstone. The preferred culet is not visible with the unaided eye (graded "medium" or "none"). The Differences Illustrated Above Are Even More Pronounced in Fancy Shapes Diamonds! 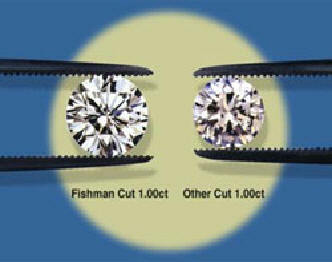 A. Fishman & Son Cut diamonds are cut to proper proportions so they look bigger and brighter than poorly made diamonds that look small and dark. See What Makes a Diamond Pretty? See Diamond Advice - Two Identical Diamonds - But with Different Prices?